Ah, the Mos Eisley Cantina… a boil in the middle of a hive of scum and villainy. It’s notable for being the point in Episode IV where it really started to hit you just how… unique… the setting was going to be. Sure, the opening fight was incredible, but it was humans against humans. We liked Jawas, but they were in robes. Here though, we suddenly get dozens of different species, we get the murder of a bounty hunter (because HAN SHOT FIRST! ), and we get to see just how cool a lightsaber can be. Despite being so critical to the entire original trilogy… after all, this was the place that brought everyone together that would pretty much move through the rest of the films… it’s been basically ignored by LEGO. We’ve had exactly two sets that deal with the place, 2004’s absurdly overpriced Mos Eisley Cantina, and this year’s absurdly overpriced remake of the same name. Sure, we’ve gotten a couple of Landspeeders as well, but that’s about it. There are a bunch of similarities, outside of the size between the two sets: both have a Landspeeder with Luke and Obi-Wan, both have a Dewback and a Sandtrooper, and both have Han and Greedo. At $40 more than the original, there is obviously a whole lot more to this set: 3 Bith, which fall into that “it’s about time” realm of minifigs, and a lot more parts. To be fair, I was excited when we saw the name first leaked, and then very let down when we finally saw this thing. It shows that LEGO knows exactly how to manipulate us AFOL fans with the inclusion of the Bith in the set, since I don’t think Greedo would have been enough by himself to get us to buy it by our first impressions alone. Of course, now that I’ve gotten it in hand, built it, and started reviewing it, the real question is does it line up to those impressions. And if so, what joke I am going to use to make fun of it? Piece of Bith is the low hanging fruit insult, and just strikes me as too easy. Sure, it ties in nicely to what our forum filter does when we use bad words, but I think I’ll have to give that a pass. I also went with “it’s a hive of scum and villainy that focuses way too much on the ‘scum’ part,” but that takes some explaining. Guess I’ll have to keep thinking about it. 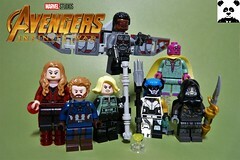 This set is packed with minifigures, and its safe to say, before I show off any pictures of the structure, that the reason a lot of us would buy this thing is because of the three guys on the left and probably the green dude in the middle. Sure, there’s Luke (the same as in the Sandcrawler), a new version of Obi-Wan, the same Han Solo that came in the Microfighter, and a new Sandtrooper… but getting our own Cantina Band is just… like I said, LEGO knows us. I curse them for it. This is the same Luke we got in the Sandcrawler. At least the lightsaber makes sense on him here. The face-line infection that’s terrorizing LEGO minifigs is also plainly apparent when you line up New Hope Lukes. Personally, I like the fourth one up there, but there’s something to be said for the classic guy. And the actual classic one up there, not that knock-off in the book. Or it could always just be that we need more yellow jacket Lukes, but after I watched A New Hope and saw it at the end, I have to wonder where he got it. Does Yavin IV have a Kohls or something? Because he had exactly one outfit when he left Tatooine. So, here’s how I think the redesign meeting of this new Obi-Wan went: “Hey, didn’t we just make a figure for the Sandcrawler that looks kinda like Obi-Wan? Let’s just use that. Now who wants some tacos for lunch?” And that was that. Because, when I look at that figure, I see a figure that looks like they took Uncle Owen and switched the color of the printing on the torso. The legs look particularly bad, with the printing that doesn’t go around or match up. They tried to capture the robe look of a jedi and failed miserably. The printing on the left-side is particularly bad, since it doesn’t go to the edge. The quality of it looks like someone just went at this with a Sharpie. 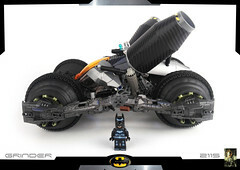 Seriously, look at the picture from Ace’s review of the Sandcrawler. Okay, sure, the head is different, and the hair is just the classic old hair, but the printing is a whole lot of copy/paste and color switching. Add a tunic in the middle, and you’re just there. I’m not a huge fan of the face print for the new Obi-Wan figure. While I haven’t seen the Bluray release of Star Wars and all the stuff that was done, I do assume that Sir Alec Guinness wasn’t digitally replaced by George Lucas. Much like Luke, the last version was far better for capturing the look. The new one doesn’t look like Obi-Wan. It’s a weird case of more detail somehow taking not just the LEGO-ness of the character but also the look of the character. Han isn’t any different from the Microfighter version of the Falcon. I like the new alt-face on this version, I think they did a decent job capturing the smirk of the character that none of the others really had. Lots of face lines, but otherwise, Han has been a fairly consistent figure in the lineup for years. Of course, this is the guy that a lot of people will buy the set for. The Bith are cool and all, but they have about the same screen time in the movie as the big asteroid worm and just as many speaking lines. Greedo, on the other hand, is the first alien we really heard talk, and the introduction to a huge string of incompetent bounty hunters in the Star Wars films. He was crucial for setting up the basic story and motivation of Han Solo (at least until the special edition came along and needlessly shoehorned in some Boba Fett and Jabba). Of course, it helps my opinion of the figure when I’ve said that the original Greedo was one of my all-time favorites. He was hard-to-find, simply because the original set was so terrible, and he had a natural build built in. Shame they don’t have a “fried by a blaster bolt” version of the figure, but maybe we can get it for the next May the 4th sale. There is quite a bit of change between them. The most obvious is the color, from the turquoise color that LEGO no longer really uses to olive green. Sadly, this is also probably the biggest miss, as Greedo was closer to the turquoise in his dark green color than the olive. The eyes are also a bit better, and won’t be prone to rub-off like the original ones were. The torso changed the color and printing as well. What’s kind of odd is that the older printing almost looks more ornate, with tighter and thinner lines. It also didn’t have the ridiculous pockets that they were too lazy to finish printing. I’ve been critical of the way that lines don’t match up between legs and torso, but this is the first time that I recall them just half-printing something like that. The least they could have done is close the side of the pockets. Likewise, the arms are no longer printed, while the legs now are. It’s also a slightly different color of blue, into the medium blue over the powder one. That kind of stinks simply because you couldn’t swap over the arms and still have it look right. We now have four different Rodians (for three characters). Still no Greeata Jendowanian, which is a shame, since Greedo’s new color would match her better, and she likely had more time on screen in Return of the Jedi than Greedo did in A New Hope. That song was Pod Racer scene long. The new Greedo does seem to be a new mold, even though it doesn’t seem obvious here. On the back of the head, with the ridges, it’s a lot more texture to it. Pictures can’t do it justice, but if you hold the new one and any of the earlier Rodians in your hand, you’ll feel the difference right away. 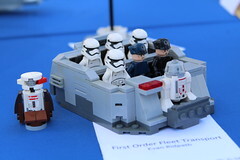 There have been six different Sandtroopers, each one released in single set (or, for the Droid Escape remake, two of them that are different). In a series that is kind of infamous for some of its reuses, it’s curious that these guys have been so sparse. I should have stocked up on the escape pod versions, because this guy will probably end up being pricy. The overall design is basically just a fusion of that sandtrooper and the latest stormtrooper (non-Rebel version). He’s finally gotten the black… whatever that is… added to the front print, and it’s a black pauldron. Like I said, I did rewatch Episode IV recently (as in the same day I was writing this recently), and there is a black pauldron sandtrooper in Mos Eisley, though there are also two orange pauldron guys (including the weak-minded one that doesn’t think those were the droids they were looking for). Also, apparently they are clones. And very messy. The pauldron is printed with a line pattern, and looks very nice. This gives us three varities of that particular pattern just on Sandtroopers, not to mention the ones we’ve gotten with clones like Rex. This is by far the dirtiest of the bunch. There are a couple of the six missing here, mostly because I didn’t grab them and the orange one on the left represents the ones from the original cantina… the only real difference has been updates to the helmet. The newest guy is apparently very messy. Of course, the whole reason that the Sandtrooper was even included in this set is because they made a new dewback mold. The last one came in the original cantina set, and is a high-value item on the aftermarket. I know, because I’ve sold them there before… the most recent shortly before this set was announced. I was prepared to just hate this guy, given that the only articularted part on him is the jaw. It’s more detailed, it’s smaller, it’s got printing… and honestly, it’s actually a bit better than the old one. This might be one of those things that we remember better through memory and all, but falls apart when you put it out. The reason why I sold off my extra dewbacks is that they just honestly never looked that good on display. The head is weird, the tail is too long, and the articulation doesn’t exactly do it much good, since the feet are connected. The new version is a much better match to the movie, save the work around the eyes and that doofy grin that comes with the articulated jaw. But the eyes on the original look even worse, and the tail, even fixed, just looks better here. Plus, the stud line on the back makes for a much better saddle, where it’s not just a function of keeping the thing assembled. The set does include four curved tiles that you can “fill” in the back with, but I wouldn’t recommend it. They’re glossier than the dewback is, and the lines of the tiles lined up are harder to ignore than the LEGO studs there. I just left my guy with the saddle. The odd thing with this is the articulated jaw, complete with little peg teeth that are good for grinding up Tattoine’s native vegetation. I also assume that these guys must have tiny brains to keep them looking for vegetation that doesn’t exist on a planet made of sand and rocks. 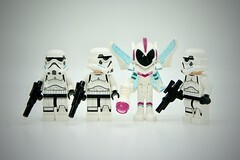 Last up in the ample minifig lineup is the trio of Bith that are featured in the seven-member cantina band. I guess what I’m saying is that if you want to get a full Cantina band, you’re going to have to get three of these sets, which is good, because then you have some extras to throw in the band for Jabba’s palace. These are obviously the wow figure of the set, and it’s cool to get them. I have no specific complaints about them, other than three almost seems like overkill. There are slight variations on the torso printing, but the heads are all the same. Also, since we have a band, it lets me slip in a picture of a simple little build like this. I’m going that this is a preview build of the next Super Special Edition release of the Star Wars trilogy on Blu-Ray. Because the Cantina band is going to get some love. Beats by D’an was also in the running for the name of the band, but it lost out to “that Cantina Band” or something like that. 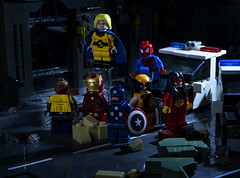 There’s a huge lineup of minifigs, so it’s kind of strange to pick on the set for what’s missing. There were 80-some different characters, not counting Han/Obi-Wan/Chewie/Luke) in the Cantina… thank you internet! This could have been a great little Cantina set, much like the Unexpected Gathering, and subbed out Obi-Wan, Luke, the Sandtrooper, and a Bith musician for Wuher (the bartender), Dr. Evazan (pig-nose guy who doesn’t like Luke either), and Ponda Baba (Walrus guy who now goes by “Lefty”) would all have been awesome additions to this set. There are also a few female figures that could have gotten some love in the set, like the twins, or the waitresses, etc. The thing about the cantina scene is that it was a visual cornucopia of characters, and they all had about the same two seconds of screentime, save the three I mentioned first. This could have been a huge boon to the set, and let them set it up as something different. Even when talking about it as a toy for kids, they love aliens and variety, and that stuff can be big. Especially when you can get Han in a $10 set and Luke and Obi-Wan have been in a bunch of others. Before we get into the Cantina proper, let’s cover the new Landspeeder. We’re only a few years removed from the Walmart exclusive, 8092 Luke’s Landspeeder. I quite liked that little landspeeder, but the big problem this set has had over the years is that the color has been consistently shifting. This newest version is two things… probably the most color accurate version, and also, apparently proof that Luke built his landspeeder out of people. That color isn’t off, those are parts that are made out of what Bricklink calls flesh (because it was the medium flesh on older minifigs) but that Brickset and LEGO have started to call Nougat. Of course, that doesn’t change the fact that the color has only been used on on people and pigs outside of the Duplo line or a Friends polybag. I suppose that means that Luke could have made it out of rawhide and not people, but I don’t remember seeing any pigs on Tatooine either. The overall build isn’t drastically different from the Walmart version outside of engines, more stickers, and the color. The stickers on the color are more movie accurate, i guess, but feel just lazy. I have no specific complaints about this build, other than it almost feels like a waste to put into the set. It could have stood as it’s own, gotten the dewback and the Sandtrooper, and we could have gotten a much better, more focused, cantina set. Also, it is made out of skin. Four landspeeders… this thing has come a long way from that original 1999 set, yet not so much if you only compare it to the previous two. I guess that’s why I felt that this was kind of a pointless inclusion. I get it, if you’re going for a Mos Eisley feel, but the name of the set is the Mos Eisley Cantina. I would have much rather seen the focus go there. Speaking of the namesake of the set, the nicest thing I can say about it is that there aren’t really any surprises to the whole thing. It’s pretty much what we thought about it when we first saw the set. Of course, I didn’t really like it so much when i saw it, so, there’s that. Seriously, LEGO could have gone down the Bag End route with this set and made it into something special, but instead, we get something that’s basically like a super-sized version of the original Cantina. Seriously. Even the same build techniques are used in a lot of places with the thing… just sub in dark tan for brown viola! Okay, that’s over-simplifying it a bit, but the whole hinged sections are there. The build itself is uninspiring, but there are some unique things to it. I particularly like the door mechanism, which uses the plate with a groove that shows up a lot in modular builds. It’s been in other sets, but this one uses a plate instead of a tile for the sliding mechanism, which adds a nice level of tension too it. The set is designed as a walk-through, which is kind of odd. It’s like a vignette that doesn’t really represent the place or the characters, it just sort of has the look. Maybe it’s more like a diorama backdrop. The doorway would open in, and I’m not sure if that’s a lamp or if it’s the detector that looks for droids. I guess 3PO and R2 can come in, because Wuher isn’t there to yell at them. The top of the doorway is a very lazy build and a dome windscreen bubble in tan. I like the prospect of this part coming back… it was used in some of the larger Alien Conquest ships, but I’m not sure how tan works. I get what they’re trying to represent here… it’s the domed top that we saw on all of the Tatooine buildings. But I don’t recall those domes ever being used like a sunroof. Tatooine has a whole lot of sun, I’d assume you’d go inside to get away from them. The real issue is that the whole base around it just feels tacked on. It’s there for structure, not for look, in a set that should pretty much be about look. We get two alcoves in this version, instead of the… chairs… that we got in the first one. The Greedo Memorial Booth is… there, I guess. The table is just a round grill brick and a round plate, and not really a table. It strikes me as another lazy build step in a set full of them, so it’s hard to get outraged. I do like the torches/lights in the back, giving us a nice source of brown connector things. Also, short 1×2 slope tiles, and some round 1×1 tiles. There are some good parts in the set, but this thing is very much less than the sum here. They push out! I don’t recall seeing the cantina shown as a (lame) carnival ride, but like I said, I haven’t watched the BRD version, so anything is possible. For the Han/Greedo murder-dome, it works fine, you can get them in there pretty easily. For the band, not so much. You can place them, but you have to work to get the back two guys in place. It’s still a very tight fit, and their Bith heads smack into the arch. I’m also not sure how you’d ever put all seven members in there, unless Bith stack up like kittens sleeping in a pile. Oh, why do I call this a lame play feature? Because that’s what does the opening closing. I guess it’s supposed to be a trough for the dewback, complete with a bone. I guess a dewback really is a golden retriever in the Star Wars universe. The whole thing just sets on pegs and looks just awful. I’d say this is a good MOC opportunity, but I’m not sure the rest of the set is really worth it. The last section of the Cantina is a bar section. Good for talking to the local scum and villainy, chopping off arms, and ordering blue milk from Wuher (who, again, isn’t here). You can tell it’s a tough place, because they use a blaster as a lever for the cash register. I don’t mind this, it actually fits the cantina a lot more than the 2×4 plate that made up the old Cantina bar. It also looks the most like anything in the Cantina other than the doorway. The registered is stickered, and there are some nice parts in there too. That sticker strikes me like a cellphone, so I guess the cantina is using Square or something like that to process payments. The hanging section is particularly nice, even if its not nearly big enough. This part of the build feels like a spot where effort was actually put into the look and feel of the set. The bar, however, isn’t the nicest part of the build. I’m going to give that distinction to the little moisture vaporator (at least, what I assume is a moisture vaporator) that clips on to the back. It’s a simple and basic thing, but you get technic triple-pins and some nice bars. It’s a little feature, but a nice one that feels more in place on the set than anything else. Ugh, and that trough. The whole set does sort of collapse down on itself if you like. It actually works out even worse than opened, even though the “feel” is a bit closer. You can’t see Han/Greedo, and there’s no space on the floor in case a dance party breaks out to some hot Bith music. It also doesn’t do the set any favors to see it closed up like that, because the whole thing just comes off as dinky when you do it. That’s the big problem with the set… in spite of the piece count coming in at 615, it never feels like a set in that part or the $70 price range. Part of the problem is that thinks like the speeder and the dewback don’t fit with the Cantina, so you just sort of forget that they’re part of the build. This set could have been so much better. I would have moved the Dewback/Speeder/Sandtrooper into their own little set and sell it to us for $35 or whatever price we could complain about. Of course, I’m not a LEGO designer, so they don’t let me make calls like that. But putting the full resources into the Mos Eisley Cantina would have made for a better overall set. Not just for me as a collector, but as a playset for kids. As it sits now, it’s not good for either of us. This is a weirdly disjointed set. You get a whole mess of minifigs and a new Dewback, where only Luke and Han are found in other sets. Of course, one of those sets is $10 and the other is $300, so you can guess which figure will be easier to come by. by themselves, that’s a whole bunch of value, though obviously not $70 value. The set is more defined on what it was missing, like Wuher or some other Cantina denizens, and the build is scattered and unfocused. On one hand, it feels like too much was crammed into the set, and on the other, what was crammed into the set wasn’t very good. The speeder… it’s made of (sand)people! Verdict: A grudging 3 for the minifigs. 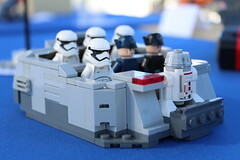 You can pick up 75052, and the rest of the 2014 Star War’s line, at LEGO [email protected]! Previous articleUltimate Spider-Man Cartoon Adds Miles Morales, Will LEGO Follow Suit?